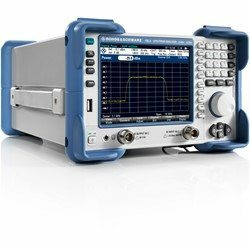 The R&S® FSC is a compact, cost-efficient solution that offers all essential features of a professional spectrum analyzer with Rohde & Schwarz quality. It covers a wide range of applications from simple development tasks to production, or can be used for training RF professionals. Moreover, it is ideal for applications in service or maintenance. The R&S® FSC features a wealth of functions for simplifying and speeding up the development and testing of RF products. Its good RF characteristics and its high measurement accuracy help to ensure reliable and reproducible measurement results. Premium Spectrum Analyzer with 9 kHz to 3 GHz Bandwidth, 10 Hz to 3 MHz RBW and a 14.75 cm (5.7") color display. USB cable and power cord Quick Start Manual and CD-ROM with R&S® FSCView Software and Documentation. 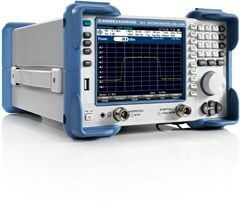 Premium Spectrum Analyzer with 9 kHz to 3 GHz Bandwidth, 10 Hz to 3 MHz RBW and a 14.75 cm (5.7") color display. Including a tracking generator 100 kHz to 3 GHz. USB cable and power cord Quick Start Manual and CD-ROM with R&SFSC®View Software and Documentation. Premium Spectrum Analyzer with 9 kHz to 6 GHz Bandwidth, 10 Hz to 3 MHz RBW and a 14.75 cm (5.7") color display. Premium Spectrum Analyzer with 9 kHz to 6 GHz Bandwidth, 10 Hz to 3 MHz RBW and a 14.75 cm (5.7") color display. Including a tracking generator 100 kHz to 6 GHz.